For many years the Western Hemisphere's outstanding characteristic from the standpoint of defensive strategy had been the narrow inter-American Isthmus that stretches from Mexico to Colombia. Even after the bulge of Brazil caught the eye of Army planners the "wasp waist" of the hemisphere continued to be the more important object of attention. Its strategic importance came, however, not from its geographical position as a link between the two continents but rather from the manmade ditch that cuts across the Isthmus and links the Atlantic and Pacific Oceans. The mobility given to the fleet by the Panama Canal is too obvious to require more than mention of the fact and the observation that a sea-minded President considered it sufficient reason for acquiring the land and building the Canal. Keeping the Canal open was a major aim of American military planners ever after. the short dry season.1 Coast artillery continued to provide the principal defense. Then, during the 1930's new instruments for delivering an attack emerged in the shape of the naval aircraft carrier and long-range bomber. Potential air bases from which an attack against the Canal might be launched came into being as a result of the growth of commercial aviation in South and Central America. Experience in jungle maneuvers was beginning to make a myth of the impenetrability of tropical forests. Finally, the Army's ability to move outside the Canal Zone and take defensive measures within the territory of the Republic of Panama was sharply curtailed by the changing relationship between the two countries. Although sabotage remained the most likely danger, air strikes by either land-based or carrier-based planes came to be regarded as the most serious threat because of the wider holes in the defense against them. through the Canal, and that of maintaining a harbor patrol at the entrances to the Canal. Both of these tasks were entrusted to the Navy, along with its primary responsibility for offshore defense. The Army air forces in Panama were to be prepared to assist the Navy in its major task of detecting and repelling enemy forces at sea, but only so far as air bases within the Canal Zone would permit-and only to an extent agreed upon by the local Army commander.3 At the top of the military hierarchy was the commanding general of the Panama Canal Department. Directly under him were the commanders of the 19th Air Wing and of the two sectors, each one of which was independent of the other. The recurrent crises in Europe during 1938 made the weak spots in the defenses of the Canal seem glaring indeed. With respect to antiaircraft, coast artillery, and air forces, the situation was particularly acute. The actual strength of the two coast artillery regiments was inadequate for the proper manning of the seacoast defenses, and as a result the infantry troops had to be given double assignments and dual training. The existing system of fixed antiaircraft batteries lacked, it was believed, sufficient depth and mobility to offer an effective defense against high speed, high altitude bombers. The air force was equipped with obsolete planes. France Field had been outgrown for some time, and room for expansion was lacking. The main runway of Albrook Field was still under construction.4 Moreover, it had become increasingly clear that by the time hostile planes came within range of the existing Army defenses it would be too late to prevent them from delivering an attack on the Canal. Effective air interception would require long-range patrols, radar installations, and a screen of outlying bases. Not one of these requirements was available. Potential bases existed in the Antilles, the island chain guarding the Atlantic approaches. The Pacific approaches to the Canal had no similar cover. able. This would make possible a reorganization of the coast artillery garrison into two antiaircraft and two harbor defense regiments, one of each type to be assigned to each of the two sectors. Maj. Gen. David L. Stone, in command of the Panama Canal Department, indorsed the proposal but urged that no troops be sent until housing was available.5 In the meantime his headquarters prepared a plan for organizing a separate coast artillery brigade as soon as the reinforcements arrived. As for the air defenses, the problem was primarily one of replacing the obsolete planes. But modern planes could not use the old airfields. On 17 April the main runway and radio control tower at Albrook Field were put in operation, and by mid-June the old, outmoded B-10's had been replaced by thirty new B-18 bombers. General Stone's views were strongly reinforced by the fact that two resolutions were before Congress calling for the acquisition of the islands. Both the War Department and the Navy began to take a more positive attitude. The Navy Department, although not inclined to appear as sponsor of the proposed measures, was willing to recommend their passage. The Army War Plans Division got as far as preparing a statement for the Chief of Staff recommending that the War Department indorse the proposals. But in the meantime President Roosevelt had decided that the acquisition of any territory belonging to the other American Republics would not be in the public interest, and on 2 June the War Department informed General Stone of the President's decision.10 The question of whether or not to acquire the islands thus passed beyond the province of the War Department, but it was not a matter that the authorities in the Canal Zone were in haste to drop. His suggestion that 999-year leases be negotiated for this purpose was considered by the War Department to be "tantamount to purchase," and therefore contrary to national policy, and to be inconsistent with the joint defense plan drawn up by the local commanders in Panama. Operating airdromes in the Galapagos Islands or on Cocos Island were not essential to the accomplishment of the Army's mission, the War Department now held; and as for the new radar equipment for which funds had been appropriated, none of it was to be installed in any foreign territory except the Republic of Panama. Since overwater search was considered a Navy function, the War Department decided that "provision of Army installations for that purpose will not be considered at this time." 12 Less than a month afterward the Germans invaded Poland and World War II had begun. In the extension of the Canal's defenses into Panamanian territory just as in the matter of acquiring the Galapagos Islands and Cocos Island, defense needs as viewed from Army headquarters in the Canal Zone ran into the complications of national policy as laid down in Washington. In both cases, the ends sought by General Stone were eventually achieved, but not by the exact course he recommended. General Stone urged, as he had on previous occasions, that the field be purchased outright and developed as an operating base. Early in January 1939 he informed the War Department that, if the Rio Hato field were obtained, no other operating airfields would be needed outside the Canal Zone. An official visitor from the War Plans Division concurred in General Stone's estimate of the importance of the Rio Hato field, but the War Department took no action except to ask the general for a priority list of sites that might be acquired if the Air Corps augmentation program received Congressional approval. As was to be expected, Rio Hato headed the list, followed by nine other possible sites of lesser importance.15 It was also to be expected that as soon as the Army became interested in using Rio Hato for official purposes the Panamanian Government would enter the picture. As long as the tactical use of the field was merely incidental, the arrangements could be made informally, directly with the owner of the property; but as the field became more important to the Army and the possibility of buying it was raised, the negotiations became a matter of public, rather than private, concern. Although arrangements for pushing the defenses out into Panamanian territory were further advanced than General Stone's proposals regarding the Pacific islands, nothing concrete had been accomplished in either case except an allocation of funds for the former. The question of acquiring island bases in the Pacific seemed to be definitely buried. As for the defense sites in the Republic of Panama the War Department was awaiting the signal from the State Department with desks cleared for action. Only a small start had been made to provide the housing for the additional Coast Artillery troops authorized the previous January. The general program of expansion depended on Congressional approval in the shape of appropriations and, until this was forthcoming in June, when the sum of $50,000,000 was made available, only a limited amount of construction could be undertaken. to Poland by treaty, Britain and France mobilized, and on Sunday, 3 September, both countries came to the aid of their hard-pressed ally. Throughout the August crisis the United States Government had carefully followed the course of events in Europe; and while it cherished the hope that the crisis might pass, at the same time it recognized the necessity of preparing for the worst. On 22 August the War Department notified General Stone that "if war breaks out in Europe" two regiments of infantry, totaling 2,678 men, with full field equipment, would be sent to Panama "immediately." The War Department also proposed to send 898 filler replacements for the antiaircraft troops, to double the pursuit plane strength, and to speed up the authorized construction.20 On the next day, 23 August, the announcement came of the Nazi-Soviet pact. Personal appeals from President Roosevelt to Hitler, to the King of Italy, and to President Ignace Moscicki of Poland failed to halt the march of events. The only discretion the War Department permitted was in the size of the armed guard; but this alone gave the Canal authorities considerable latitude in applying the regulations. Vessels were grouped in several categories on the basis of their size, nationality, and potentiality for mischief, and a corresponding transit guard was provided that varied in numbers from two to twenty-five men. The plan had been for the Navy to furnish the men for the guard; but when it was put into effect the Fifteenth Naval District was so short of manpower that the Army had to take over this function temporarily. The 18th Infantry Brigade, consisting of the 5th and 13th Regiments and numbering 2,678 officers and enlisted men, had been earmarked for Panama should some emergency require that the garrison be reinforced. As soon as it was decided to institute transit guards, the War Plans Division asked General Stone whether in view of the decision he would like to have the brigade or any part of it sent to Panama immediately. The reply was prompt: "For security and guarding of canal desire 18th Brigade be sent to Canal Zone with full field equipment including peace allowances, motor transport and heavy tentage." 23 Preliminary steps to start the brigade on its way were taken at once. Sometime between the end of October and the middle of November the troops arrived. They were a welcome addition to the garrison. amount of traffic, the stringency of the system, and the rate of rotation. In August and September 1939 an average of fifteen or sixteen vessels were passing through the Canal each day; but of these about 68 percent were vessels of American, British, French, or Dutch registry, which took a transit guard of only ten or fifteen men or less. 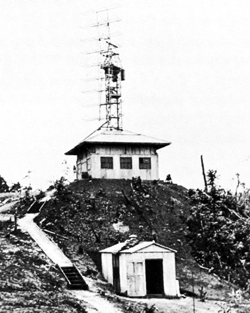 EARLY RADAR INSTALLATION (SCR-271) in Panama. The arrival of reinforcements in the fall of 1939 and the certainty that more were on the way permitted a reorganization of the old pyramidal command structure. Discussion and study at General Stone's headquarters in September and early October revealed dissatisfaction with the two-sector system and produced a plan abolishing the sectors and organizing all the ground forces and defensive installations into a permanent mobile force, with a sector organization of its own. The first step was to remove the antiaircraft troops from the sector commands, which was done on 16 October by the creation of the Panama Provisional Coast Artillery Brigade (AA).30 Possibly because a change of commanding generals was scheduled for the beginning of the year nothing further in the way of reorganization was attempted for the time being. In January 1940 General Stone completed almost three years of duty as Commanding General, Panama Canal Department, and was succeeded by Maj. Gen. Daniel Van Voorhis, who came to his new post from command of the Fifth Corps Area. One of the first tasks the new commanding general undertook was to complete the reorganization. case for abolishing the sector commands, forcefully presented by both General Dargue and Maj. Gen. Ben Lear, commander of the Pacific Sector, and for immediately creating a mobile force, impressed General Van Voorhis and received the blessing of General Marshall. The latter, who at the time happened to be inspecting the defenses of the Canal, seems to have given his informal approval to the plan early in February, after a conference with General Van Voorhis on Monday, 5 February. The harbor defense units, which had remained under the sector commands after the creation of the antiaircraft brigade, were now merged with the antiaircraft units into the Panama Separate Coast Artillery Brigade (Provisional). The infantry and field artillery, with some of the Quartermaster and Signal Corps troops, were grouped into the Panama Mobile Force (Provisional). Command of the mobile force was given to General Lear, and the Coast Artillery Brigade, which was reported by the New York Times to be the largest and most heavily armed artillery unit in the Army, was placed under the command of Brig. Gen. Sanderford Jarman. These changes and the abolition of the Atlantic and Pacific Sectors were put into effect by General Order No. 5, issued by General Van Voorhis on 16 February 1940. Formal approval by the War Department followed; two months later.32 General Lear's headquarters and the bulk of the mobile force remained on the Pacific side of the Isthmus. On the Atlantic side, within an area that corresponded roughly to the old Atlantic Sector, the mobile forces were commanded by General Lear's representative-Brig. Gen. Joseph M. Cummins, former commander of the Atlantic Sector. The new organization may well have been a more centralized and functional structure than the old; that it provided a more uniform distribution of staff work was clear and unquestionable. The new arrivals had so far outdistanced construction that a serious shortage of housing existed. At Albrook Field enlisted men were sleeping in the hangars, and at other stations the troops were quartered under canvas. Indecision in Washington about the type of contract delayed the arrival of contractors' forces until July 1940-one year after construction funds were made available. Until then all the construction work was done by the troops themselves. Tropical rains, the continued influx of troops, and frequent tangles of red tape between the different branches of the garrison added to the difficulties. 35 The Panama experience, how plans for deferring reinforcements until housing was ready could give way under the pressure of emergency, set a pattern that was to recur again and again at the newer bases in the Caribbean and the North Atlantic. PANAMA AIRFIELDS. 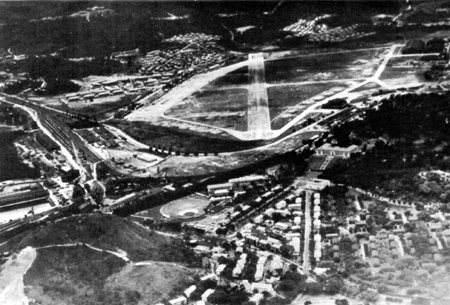 Balboa and Albrook Field (top). Rio Hato (bottom). Construction and planning were placed in the hands of the Canal administration, not of the Army, although the War Department controlled the purse strings. The plans called for a series of single locks paralleling, but at some distance from, the existing double chambers. The new locks were to be two hundred feet longer and thirty feet wider than the old, in order to accommodate the 58,000-ton Montana-class battleships that the Navy placed on order in September 1940. This feature soon began to override the security consideration as the principal reason for the project. struction as rapidly as he could. 46 Four months later there was a radical change of plan. proposed in July 1938 that a Puerto Rican defense force be organized: "Keeping the enemy out of Caribbean waters is essentially a Navy problem," he wrote, "but, if need be, the Army can lend substantial support to the Navy through the use of aircraft based on Puerto Rico, when and if more important missions do not demand their use elsewhere at the time. A logical solution of the problem," he continued, "is this: construct a suitable air base and landing fields in Puerto Rico, but keep the Air Corps garrison to the minimum required for maintenance; . . ." 51 As part of the evolution of hemisphere defense in October and November 1938 the Joint Planning Committee undertook a study of this and similar proposals, which by the following February had progressed to the point where the War Plans Division thought an independent headquarters in Puerto Rico was necessary. It recommended, therefore, that Puerto Rico be taken out of the jurisdiction of the Second Corps Area and be made a separate overseas department and that a general officer with a small staff be assigned to command the department and to develop a defense project and plan. The Chief of Staff approved the recommendation of the War Plans Division on 10 February 1939. 52 At this time the only troops on the island were two battalions of the 65th Infantry, a local Puerto Rican unit. The principal policy recommendation of the board, namely, that a separate local command be established over the Puerto Rico-Virgin Islands area, had been adopted by the War Department on 5 May, when the Puerto Rican Department was established effective 1 July 1939. 55 Brig. Gen. Edmund L. Daley was appointed commanding general with headquarters at San Juan. Although there had been some talk at one time of placing Puerto Rico under the Panama Canal Department, this idea had long since gone by the board and the chain of command was run direct from the Chief of Staff. In mid-August General Daley and his Staff were working on the preparations that were preliminary to drawing up the defense project and the coastal frontier and operations plans. A thorough reconnaissance of Puerto Rico and the Virgin Islands had been made. An acquaintance with all the military forces that might become available -the 65th Infantry, the National Guard, and Reserve groups- had been forged. Counterespionage measures had been organized, and a revision of the internal security plan was undertaken. 56 In the course of planning, General Marshall raised the question whether the National Guard and Regular Army units could not be mixed. His idea was to use Regular Army troops for the headquarters of the company or battalion and National Guardsmen for the rest of the unit. The chief of the War Plans Division thought this was more of a mixture than was necessary but that it might be possible to use National Guard battalions to fill out Regular Army regiments. Then the ramification whether to use Puerto Rican soldiers in the same unit with continental Americans developed. 57 Before any policy on this question was established and while the defenses were still being plotted, the European crisis made emergency measures necessary. promised reinforcements to more than 1,500 officers and men. 58 The first arrivals, Battery D of the 69th Coast Artillery (AA), landed at San Juan on 25 September. By the end of October all the troops except the company of engineers had arrived. Their arrival late in November brought the total strength of the Puerto Rico garrison, including the 65th Infantry, to just under 3,000 officers and men. Highest priority had been given by the War Department to the preparation of an emergency airfield suitable for B-17 operations. 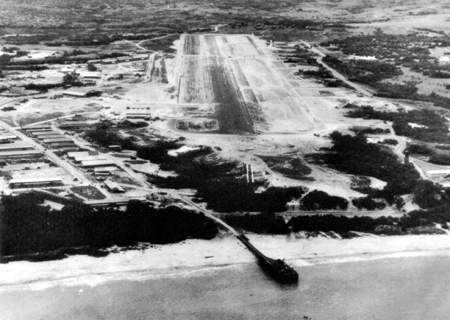 On 6 September, Puerto Rico Air Base No. 1 was established in a cow pasture near Point Borinquen. Work on a temporary landing strip was immediately started.59 In November, the 28 officers and 228 enlisted men of the 27th Reconnaissance Squadron arrived at the air base, and as soon as the runway was completed the planes of the squadron -nine B-18 bombers- were flown in. This was on 5 December 1939. 60 With the arrival of the planes the emergency measures were completed, and the Puerto Rican Department could look forward to a more orderly development. even began to take shape. The limits of the Puerto Rican Department had been officially defined as "the Island of Puerto Rico, including all keys and islands adjacent thereto, and all islands belonging to the United States within the Virgin island group." 62 The Joint Board, however, in its recommendations earlier in 1939 had delineated a somewhat larger area of responsibility -a rectangle bounded north and south by the 17th and 20th parallels, on the east by a line just off Cape Enga�o, the easternmost tip of the Dominican Republic, and on the west by the 63d meridian. This was probably the broadest expanse within which the defenses established in Puerto Rico in 1939 could be used effectively. Nevertheless, by ensuring against the establishment of an enemy foothold in this area, the defenses of Puerto Rico were indirectly a protection to the Panama Canal. Then the war in Europe erupted into a blitzkrieg. Turning against the neighboring neutrals, the German armies outflanked the major French and British defenses. By mid-June practically all of western Europe was in the clutches of Hitler. On 17 June General Marshall ordered the Panama Canal Department, the Hawaiian Department, and the west coast to alert themselves against a surprise attack. 65 The directive sent to General Van Voorhis required him to take "every possible precaution" against any sort of action, "naval, air or sabotage," aimed at putting the Canal out of commission and it specified that the "air component and antiaircraft forces must be in state of preparedness for action at any hour." 66 General Herron deployed his entire antiaircraft and security forces into defensive positions, with live ammunition, and made arrangements with the local naval commander for a complete air patrol, which the Navy immediately put into operation. But neither the official histories of the Panama Canal Department nor the more likely files of the War Department reveal specifically what measures General Van Voorhis took in Panama. Not long after the alert of June 1940 the whole complexion of the Canal's defenses changed as a result of Britain's offer of base sites in Bermuda, Newfoundland, and the West Indies. With the acquisition of bases in Jamaica, Antigua, St. Lucia, Trinidad, and British Guiana, the possibility of making the Caribbean a mare clausum presented itself.